This is the second book in the Incorrigible Children of Ashton Place series. To read my review of book one, The Mysterious Howling, click here. Penelope Lumley and the three Incorrigibles, Alexander, Beowulf, and Cassiopeia, are just recovering from a rather disastrous holiday ball when Miss Lumley is invited to London to visit with her old headmistress. When Penelope suggests the trip to her employer, Lady Ashton decides that the entire household must settle in London. 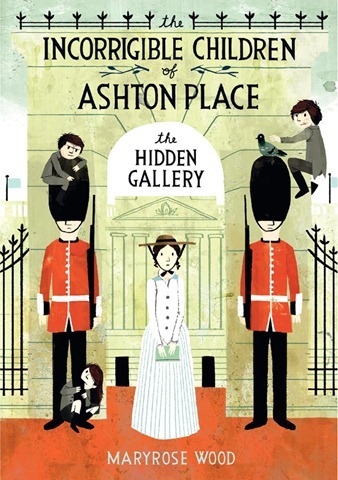 Penelope is excited for all of the learning opportunities, and guided by a rather peculiar and oftentimes misleading guide book, she and the children embark on a journey to London. But there are dangerous people in the big city to avoid, and new friends to be made. As Penelope keeps an eye on her wayward charges, she discovers that her unique guidebook may be another clue to uncovering the secret of her past. 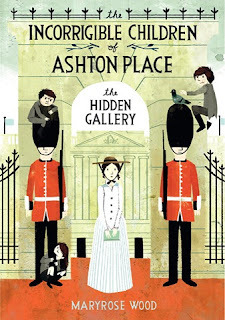 As charming and as riotously funny as its prequel, The Hidden Gallery delves deeper into the greater mysteries surrounding the lives of one plucky governess and her (somewhat) reformed charges. Part of what makes this series of books so enjoyable is Wood's unique voice. She tells a wonderful story while imparting her modern sensibilities and perspectives within the historical setting. It not only is engaging, but makes the books accessible for kids who might find historical fiction a struggle. Charming Penelope is equally as winning—her passion for teaching and for bringing up the Incorrigibles is wonderful, and her sensible outlook on matters concerning the mystery of the hidden gallery and the children's origins just rackets up the suspense. Though answers are scarce and revelations are slow, the action in this installment is more than enough to keep readers entertained. Theatrical in its drama and thrilling in its escapades, the plot of The Hidden Gallery will be hard to tear away from—though who would want to? The book wraps up nicely with the promise of a sequel, new friends, and even a hint at the supernatural. Make sure you have book three, The Unseen Guest, on hand. Cover Comments: I love the cute illustrations for these covers--classic and fun! I love the Incorrigibles series! I listened to the audiobooks of the first two and the narrator was amazing. She made the book even more hilarious.